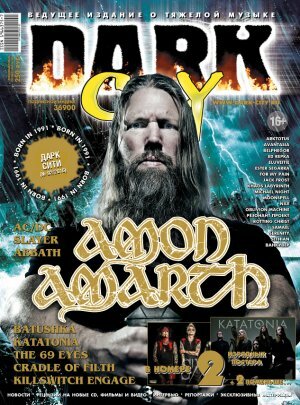 AMON AMARTH, AC/DC, SLAYER, ABBATH, BATUSHKA, KATATONIA, THE 69 EYES, ROTTING CHRIST, CRADLE OF FILTH, KILLSWITCH ENGAGE, ARKTOTUS, AVANTASIA, BELPHEGOR, ED REPKA, ELUVEITIE, ESTER SEGARRA, FOR MY PAIN, JACK FROST, KHAOS LABYRINTH, MICHAEL NIGHT, MOONSPELL, NILE, OBLIVION MACHINE, РЕЗОНАНТ ПРОЕКТ, SAMAEL, SERENITY, SETHIAN, ВАНКУВЕР. НОВОСТИ (Ozzy, Blackmore’s Night, In This Moment, Iron Maiden, KISS, Lamb Of God, Leaves’ Eyes, Status Quo, др. ); РЕЦЕНЗИИ НА CD (Accuser, Almanac, Annodomini, Artillery, Babymetal, Brainstorm, Caliban, Crematory, Destroyer 666, Exumer, Forces United, Louna, Magnum, Metal Church, Mob Rules, Mordor, Mystic Prophecy, Otep, Paragon, Rhapsody Of Fire, Sabaton, Shakra, Sunstorm, Van Canto, Varg, др. ); КИНОТЕАТР DARK CITY (Бэтмен Против Супермена; Игра На Понижение; Книга Джунглей; Он Никогда Не Умирал; Дедпул); ВИНИЛОВОЕ БЕЗУМИЕ; ЛИСТАЯ ВЕТХИЕ АРХИВЫ… (DarkCity #17).